Use this FREE Cub Scout Pack Meeting Planner to ensure that your pack meetings run smoothly. This planning sheet (that you can edit) allows you to make notes about each part of your agenda from the opening ceremony to the closing ceremony. Edit with a pdf reader or handwrite on a printed copy. Before we can use our Cub Scout pack meeting planner, we need to understand more about pack meetings–what they are, what parts they have, and how to plan them. You’ll find the pack meeting planning sheet following this information. What is a Cub Scout Pack Meeting? A pack meeting is a monthly event that brings all the Cubs from all ranks together for a fun event. Families are encouraged to come, including younger siblings. They usually last about an hour and a half. A pack meeting gives Cub Scouts an opportunity to see that they are part of something more than just their den. Younger Scouts get to see what older Scouts do, and older Scouts get to serve as role models for the younger kids. Dens participate in the pack meeting by leading a song, performing a skit, or conducting a ceremony. Cub Scouts are recognized for their achievements during pack meetings. They may be awarded loops or pins for adventures they’ve completed. If they have earned their rank, the Cubmaster will present them with their badge. Gathering Activity – Gathering activities (or pre-opening activities) are designed to give the Scouts something fun to do before the meeting starts. If the Scouts are occupied, leaders will have time to finish setting up for the meeting. Children should be able to join in at any time. They should be easy enough that a parent or den chief can facilitate them without a lot of instruction. You should be able to end them at any time. Opening Ceremony – The opening ceremony is the official start of the meeting. It should include a flag ceremony and saying the Scout Oath or Law (or both). Your pack may also sing a song or say a prayer. The Cubmaster will welcome everyone to the pack meeting. A Cub Scout carnival is a fun pack meeting program! Program – Your program consists of an activity, game, or special events such as a guest speaker or presentation. Den Presentations – Your dens may have presentations to share with the pack. There are some requirements that ask the boys to present to the pack. Note: These could just be displays. If that’s the case, ask the den to have them set up at least 20 minutes before the meeting starts so that people may enjoy them when they arrive. Skits, Jokes, and Run-Ons – Assign each den something to do during the pack meeting. The dens responsible for skits might want to create a DIY Cub Scout skit. Cub Scouts receive rank badges at pack meetings. Awards – Recognize the kids who have completed adventure requirements by presenting them with their loops or pins. If applicable, award rank badges. Present any special awards. Don’t forget to recognize adult volunteers too. Typically, pack meetings are planned at your pack committee or leaders’ meeting. Take a look at what your program will be, and assign any tasks that need to be done before the meeting. This can easily be done with the pack meeting planner. Make sure you designate who is responsible for setting up and cleaning up your meeting room. Here are a few suggestions for your pack meetings. When handing out awards, make sure you and the Cub Scout are arranged in a way that makes it easy for parents to take pictures. Have the boy stand to your side, facing the audience instead of facing you with his back to the audience. Have an activity for the younger siblings such as coloring books or puzzles. Whenever you can, hold part of your meeting outdoors. I’ve created two Cub Scout Pack Meeting Planner templates that you can use to help you. Originally, I planned to make a single page version. My friend, Betsy, reviewed the sheet and suggested that there needed to be more space for each item, so I also made a two-page version. Thanks, Betsy! 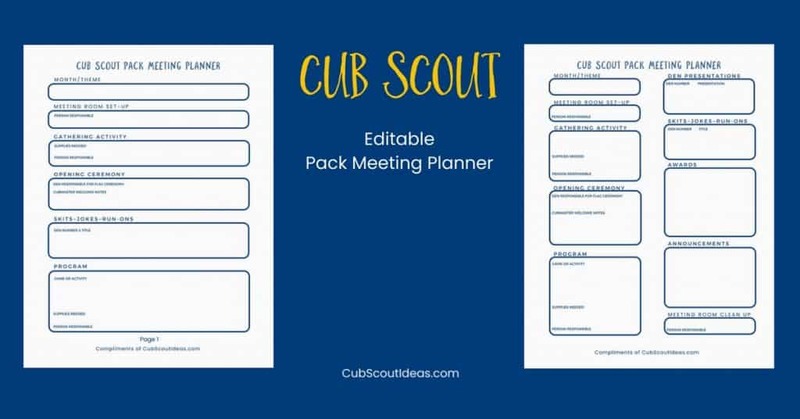 These Cub Scout pack meeting planning sheets can be printed or filled out on your computer. To download the pack meeting agenda templates, enter your email address below. If you don’t get an email from me within 15 minutes, check your spam folder. If it isn’t there, please email me at [email protected], and I’ll make sure you get these! Enter your email to get your printable Pack Meeting Planners which include the one-page and two-page versions! I would love to hear how you plan your Cub Scout pack meeting plans! Leave me a comment below to let me know. P.S. This Cub Scout Leader book has GREAT information to help you and other volunteers!